Insight into using digital cameras for film-style production. The Sony F3 and F65 are available to rent now, here at DivisionCamera, and Sony’s new F5 and F55 cameras are coming out very soon, the question is, what makes the new cameras unique? I was invited to attend the unveiling of the new cameras last month and had the opportunity for some hands-on time with them. In addition to the cameras they also showed off the new 4K RAW recorder that works with the new cameras as well as the FS-700, cinema prime lenses, their 84” 4K TV that had been making the rounds at previous trade shows as well as their new 30” 4K production monitor. The emphasis is definitely on 4K capture and exhibition. Apparently the upcoming new 4K home entertainment standard isn’t truly 4K, it’s called QFHD or Quad Full HD which is almost true 4K but not quite. There is actually an option to record either true 4K or QFHD. Some of you have doubtless already seen the 84” TV in person and can attest to it’s high level of detail but this is the first time I’ve seen the new 30” 4K production monitors and they are ridiculously crisp. It’s akin to Apple’s retina display devices, but even higher resolution. But enough of that, let’s look at the cameras! The F5 and F55 cameras are small, cubic and light, the bodies are 4 lbs. and change. They look exactly the same except that the lens mount is black on the F5 and silver on the F55. The real difference is that the F55 has a higher quality Bayer color filter on the sensor and twice the processing power, similar to the difference between the Epic and the Scarlet. The image the F5 produces is very similar to the F3 and FS-700. While the image the F55 produces is very similar to that of the top-of-the-line F65 (but the F65 is still Sony’s top-tier camera). The cameras’ respective ISO’s are 1250 for the F55 and a whopping 2000 for the F5. The bodies have two SxS slots in them and new faster SxS cards are coming out: SxS Pro+. The SxS cards record a myriad of compressed formats at varying resolutions, up to 4K on the F55. The F55 has 4 HD-SDI and one 4K HDMI outputs each allowing for 4K output for either monitoring or external recording. The third recording option is their new external AXS-R5 RAW recorder that not only works with either the F5 or F55 but also the NEX FS-700. 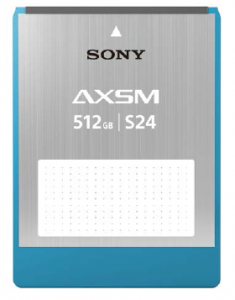 The recorder records to a new SSD card format called AXSM. The cameras are an intelligent modular design: the raw recorder pops on to the rear of the cameras, making it longer, similar in shape to the Alexa, but smaller. A battery module pops on to the back with new V-mount Sony batteries (or most any other kind of V-mount battery, I suppose), and also has a couple of Hirose accessory power outputs. This module is not required when using the RAW recorder unless you want the Hirose connectors. Each of these modules are powered by recessed 4-pin XLRs, so at least you won’t need an adapter for that if you run off block battery power or what-have-you. There are also small and smartly placed modules that attach to the side of the body, one module for two audio XLR ports and another for timecode and sync connections and functions, additionally there is a toggle switch on it for TC IN or OUT, I liked that, no menu to futz with. Speaking of the menu and buttons it’s a similar layout to the F65 or Alexa, so its simple, clean and intuitive. The lens mount is a new mount called FZ, they have every kind of adapter to fit in to it, PL of course, all the way down to FD. Additionally the cameras have internal ND 0.9 and 1.8 filters with a manually operated dial. 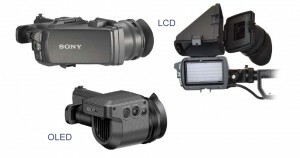 Due to the number of formats and options available, the amount of over-crank the cameras can do is varied and depends on the set-up. The F5 internally can record up to 120 fps in 2K. With the external RAW recorder it does 60 fps in 4K RAW and 120 fps in 2K RAW. The F55 can record internally 60 fps in 4K, 180 fps in 2K. And with the RAW recorder does 60 fps in 4K and 240 fps in 2K. In all of these modes the entire surface of the sensor is used, it does not crop down, ensuring that the field of view and image quality remains consistent regardless of the resolution and speed. They have a new LCD EVF and a fancy new OLED EVF. The new EVFs are articulate and positional. The DVF-L350 3.5” LCD EVF looked very sharp and bright. When using it as an eyepiece, it reflects the image off a mirror, through a lens you view through. This eyepiece is detachable/flips up and away to act alternately as a small monitor. The DVF-EL100 OLED EVF is even higher resolution (720p) and had very nice motion, no judder that I could see, unlike the LCD EVF had no mirror to reflect off and is therefore smaller, but can’t act as a small monitor. Sony is also putting out a new round of cinema primes; metal bodies, gears in the same positions, all the same length except the 135, f2.0. List price of $24,000 for a six-pack (although will likely sell for even less). I like the looks of the new design very much. Concerning the cameras, there are two sets of pins in the camera lens mounts to allow the capture of metadata from any lens that supports it and power supply for lens servos allowing use of a lens like the Fujinon Cabrio 19-90 for ENG style shooting without cable clutter. It is very clear that these cameras are meant to fill the gap between their FS-700, f-3 and their F65. 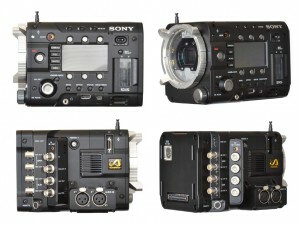 As of this writing, the price for the cameras are $28,990 for the F55, $16,490 for the F5 and $5,350 for the RAW recorder. They will all be available to rent at Division Camera, Hollywood. 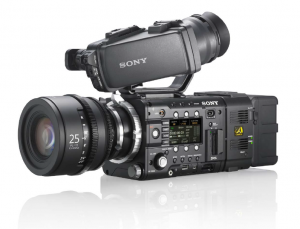 Additionally, you can get Sony’s highest quality camera, the F65, today. Check out DivisionCamera.com for prices and info. Sound off in the comments with you your thoughts, comments or questions.